It feels bleak, like no one else can understand what you’re going through – even though you’re surrounded by a sea of people in the waiting room. “Once you hear the word cancer, you can’t forget it,” said Tony Towler, diagnosed with stage IV renal cell carcinoma in 2011. Mr. Towler first visited a doctor after finding blood in his urine. After tumors were found in his kidneys, he was started on everolimus and given 18 months to live. Not happy with his prognosis, he sought out the opinion of James Brugarolas, MD, of University of Texas Southwestern, Dallas. 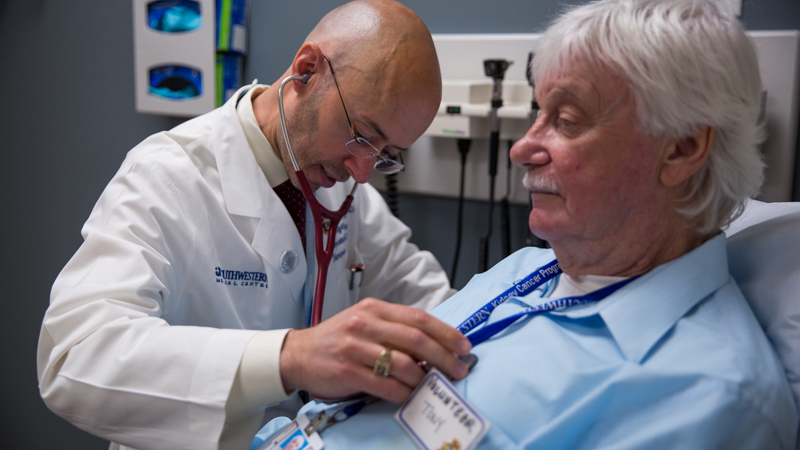 Nearly 7 years later, Dr. Brugarolas continues to treat Mr. Towler, now with immunotherapy. Mr. Towler started on nivolumab in December 2017, and after some progression, is now taking ipilimumab as well. From the negative experience with his first physician to conflicting information about treatments, a lack of support, and the day-to-day isolation associated with a terminal illness, from the beginning Mr. Towler wondered if there were others who understood his situation. Coincidentally, Dr. Brugarolas and the UT Southwestern staff were rolling out a patient advocacy program and asked Mr. Towler to be the first to join. 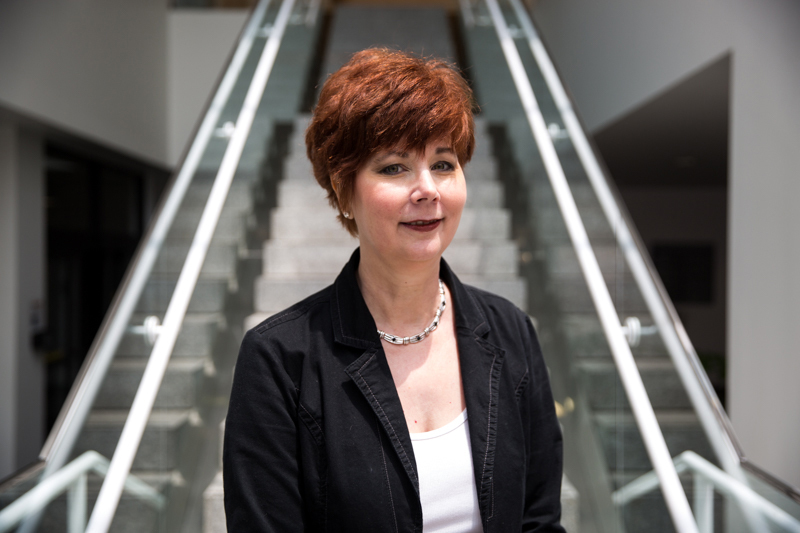 Melinda Chelette, another patient who eventually joined the Patient Council, first came to the UT Southwestern medical center overwhelmed and terrified after receiving a stage IV renal cell carcinoma diagnosis in 2012. The waiting room felt like a “massive sea of human suffering,” she said. To Ms. Chelette, there was no one to turn to, no comfort – until Mr. Towler showed up. The Kidney Cancer Program Patient Council at UT Southwestern is among only a few of its kind, according to Dr. Brugarolas. The advisers are current stage IV patients who consult with and encourage fellow cancer patients. While Mr. Towler and Ms. Chelette both have renal cell carcinoma, they provide their education and encouragement to all kidney cancer patients. Merlinda Chelette is a renal cell carcinoma patient and a member of the Kidney Program Program Patient Council at UTSW. 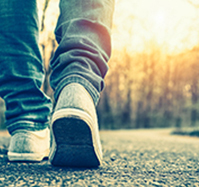 “A person who isn’t going through the disease process can’t really tell you what the experience is like, but when you meet a fellow cancer patient … and they are walking this journey the same as you, it’s such a comfort,” said Ms. Chelette. The Patient Council has grown to include five members – including Mr. Towler and Ms. Chelette – and collaborates with researchers and clinicians. The council members use their experiences with the disease to help someone in the waiting room, someone dreading that visit, someone needing support. 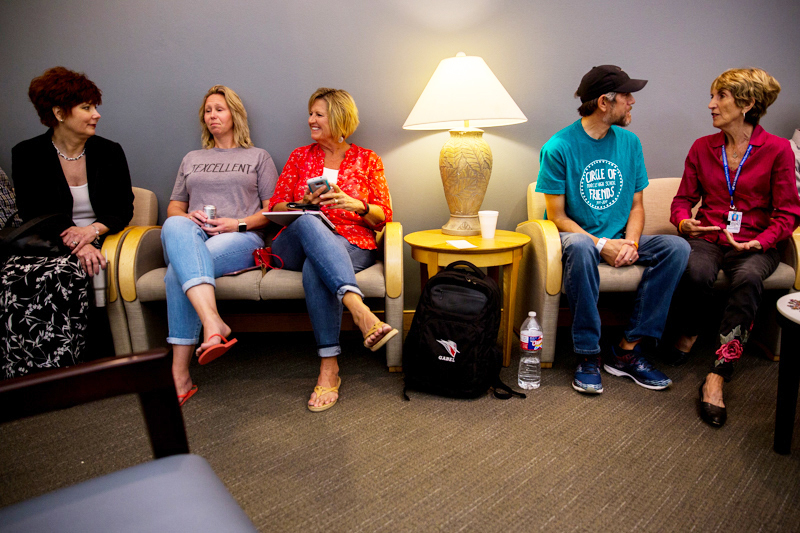 Ms. Moschos and Ms. Chelette comfort the Gables family in the waiting room at UTSW Harold C. Simmons Comprehensive Cancer Center. On this visit with the MDEdge reporter in attendance, Ms. Chelette sits with a patient’s wife and mother-in-law discussing what they did for Mother’s Day; Mr. Towler comforts a long-time waiting room friend whose cancer has returned; and Sophia Moschos, a fellow Patient Council member, resumes her caretaker role. 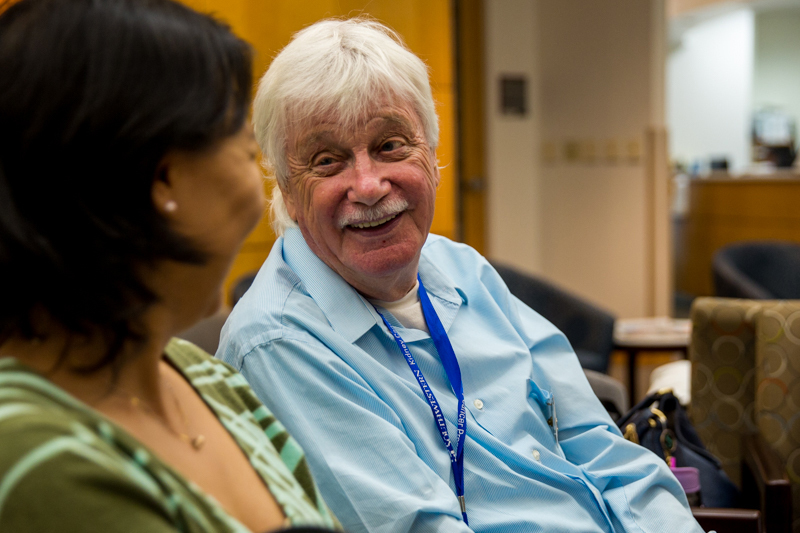 Between a doctor visit and treatment, Mr. Towler chats with longtime waiting room friend, Yuxin Zeng in the waiting room of the UTSW Harold C. Simmons Comprehensive Cancer Center. In 2009, Ms. Moschos’ husband was diagnosed with kidney cancer. She accompanied him to every appointment and waited by his side for scan and test results. She cared for him as his disease progressed and was by his side when he died 20 months later. The advocates fill a spectrum of support roles – from understanding caretaker to empathetic patient to educator to friend. The Patient Council is still evolving and adjusting to the needs of patients. 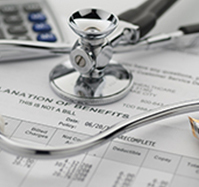 While hoping to take patients’ minds off scans, tests, and the disease, the Council members are looking beyond the relief they provide others to finding other ways to have an impact against the disease. 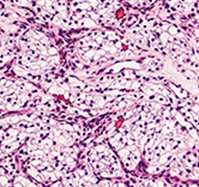 There is less awareness regarding renal cell carcinoma than other diseases, such as breast cancer or leukemia, Ms. Chelette and Mr. Towler said. 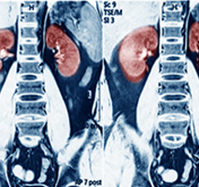 The Council members are not only trying to expand the community of patient advocates but also to raise awareness about renal cell carcinoma and to increase funding for research nationwide. Ms. Chelette, with the help and support of the Council, has raised nearly $200,000 for kidney cancer awareness. While the advocates raise money, back in the waiting room, they offer the emotional and practical support only experience brings. One newly diagnosed patient expressed concern with his medication. He was taking it in the morning, prior to breakfast, and it would make him nauseous for the rest of the day. Mr. Towler, who had previously taken the same medication, advised him to take it at night instead so that the symptoms wouldn’t persist throughout the day. 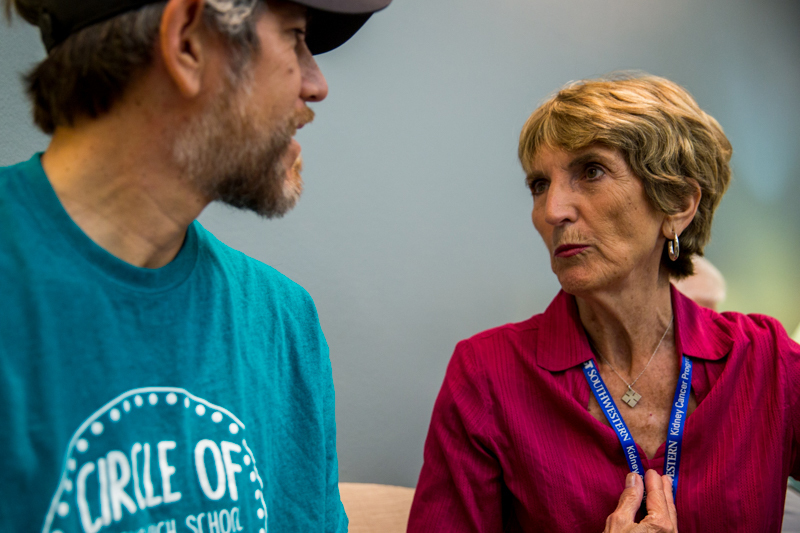 “You don’t want someone to give up on treatment before they’ve given it a chance,” said Ms. Chelette, who has similar experiences sharing tips and tricks with fellow patients. Although Sophia Moschos is not a patient at UT Southwestern, she’s spent much of her time in the waiting room. When her husband was diagnosed with cancer in 2009, she was his primary caretaker. She continues his legacy by providing comfort and support to newly diagnosed patients. The most significant, and impressive, qualities about the patient advocates is their generosity, Dr. Brugarolas said. 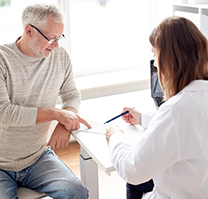 Not only are they coping with and managing their own cancer, they take time out of their schedule to comfort and educate patients new to the disease. “They’ve formed a community,” he said. “We’re another set of friends with a not-so-great common denominator,” laughed Ms. Moschos. 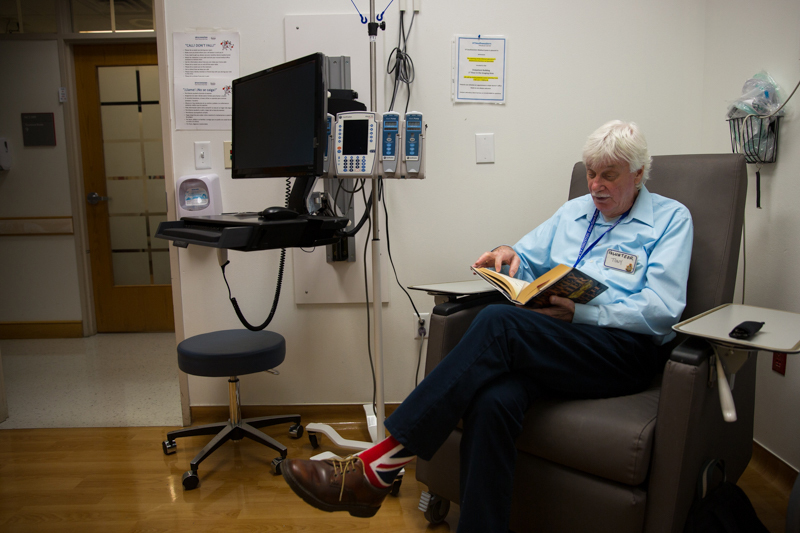 After meeting with patients in the waiting room, Mr. Towler receives his IV cancer treatment. In December 2017, Mr. Towler started on nivolumab. However, scans showed progression so, in March, ipilimumab was added to his treatment.